It's long been rumored that Apple is going to launch three new iPhones this fall, all with a design very similar to that of the iPhone X from last year. One model will keep that device's screen tech and size, another is apparently coming with a 6.5" OLED panel, while the third model will be a more affordable 6.1" handset with an LCD display and lower resolution. Today a report from Bloomberg basically confirms all of that, adding a few new bits and pieces of intel allegedly coming from "people familiar with the products". The biggest iPhone yet is to have a screen "close to 6.5 inches", while design-wise it will act like a Plus version of the successor to the current iPhone X, keeping the overall shape, the notch, and the stainless steel frame and glass back. Its display's resolution could be 1,242x2,688, since at least one prototype is boasting that. If so, it would be the highest-res iPhone ever. The body will be about the same size as that of the iPhone 8 Plus, with the extra screen real estate made possible by cutting the bezels. Furthermore, Apple is reportedly thinking of releasing it and the iPhone X successor in a gold color version. This was planned for the X but abandoned in the end because of production problems. 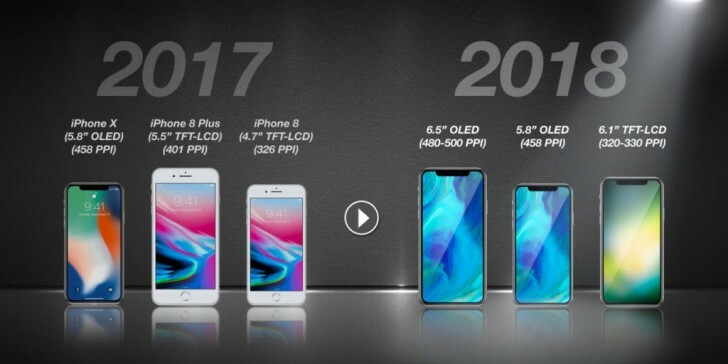 The two premium 2018 iPhones are to be powered by the upcoming A12 chipset. The larger iPhone may also have dual-SIM functionality for the first time in Apple's history, to appeal to travelers in some markets. That said, the company may simply forego this and wait for eSIM to become more accepted by carriers. The lower-cost model (don't read that as "cheap") will have the same edge-to-edge screen design as the premium offerings, complete with notch and Face ID support (and no Touch ID). Its cost will be cut by using the cheaper LCD technology and an aluminum frame. It was also rumored not to pack 3D Touch. "There's a huge difference between. The r&d, hardware, and software cost of the s9 and note8 all costing more compared to iPhone." The original unsupported claim.